A professional online profile image, or business portrait, is more than just “Price”, it’s an investment towards your visual representation and your business. A professional business portrait speaks volumes when it comes to making a strong digital introduction and lasting impression. To maintain the competitive edge in the digital driven business world, it’s crucial to present a polished and professional headshot for online marketing materials such as a corporate profile web pages, commercial proposals, press releases, corporate biography pages, and business social networks. (Example A) is a common lighting technique used by others in our industry. 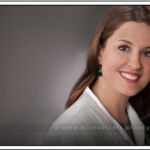 (Example B) is an example of Michael’s standard lighting setup for business portraits. 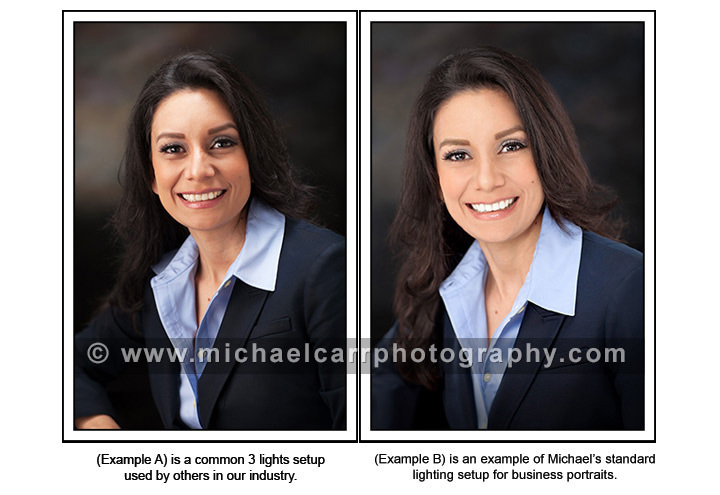 Houston portrait artist, Michael Carr, offers the professional photography you need to capture the quality executive portraits to market your online image. Michael’s attention to detail ranges from proper clothing selection, body language, and posing techniques. His effective use of lighting techniques and his firm understanding of facial analysis are talents that have been acquired through over 20 years of portrait photography experience and training. His clients include authors, law firms, and energy executives from several of Houston’s oil and gas industries. The studio is conveniently located off 610 and Woodway within the Tanglewood area (77057) in a commercial office building. The studio is equipped with state of the art digital equipment and real time previewing during the headshot sessions. The sessions are photographed using a five light setup tethered to a 22″ monitor for quick previews during a session. On set adjustments to expressions, hair or jewelry are quickly addressed allowing sessions to be completed within 15 minutes. Image previews are ready for presentation within minutes after the sessions are completed. Business professionals can relax or continue to conduct business as the studio is equipped with a full internet lounge and conference area for today’s professional. Michael Carr Photography is a full service studio specializing in portraiture with several studio background options to select from. In addition to in studio sessions, we also offer location business sessions. Please call for a quote when inquiring about these services. To view more of our portfolio samples, visit www.michaelcarr.photography or to schedule your session call the studio at 713-461-2862.